From the CD Artefacts of Australian experimental music, 1930 - 1973. 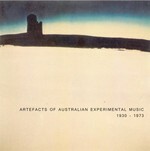 Artefacts of Australian experimental music, 1930 - 1973. Instrumentation: Performers operating radios, televisions and record players.